The 9 Top Sneaker Releases of 2018: What to expect during this loaded year? Now that 2017 sneaker releases are done, you and millions of other sneakerheads are looking to find out which sneaker releases to go for in 2018. Which are worth the pain, the stress and the money? Although your taste might tempt you into preferring a pair over the other, don’t be fooled. Your personal preferences have nothing to do with this. 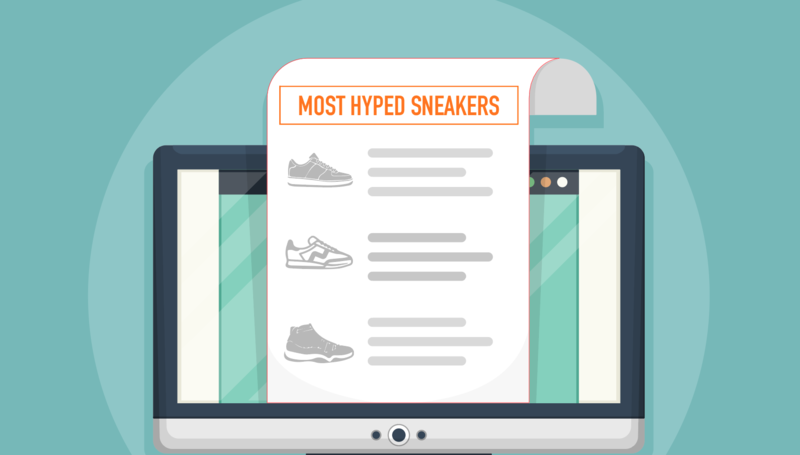 Sneakers hype and value are based on facts, numbers, and history. Heck, Hype is a science by itself. And we’re here to break it down for you, all the major sneaker releases of 2018 and all you need to know to cop ’em. 2018 already started on the right foot, and let me tell you things are already looking dope. Sneaker releases such as the Juice X Adidas NMD, The Levi’s X Air Jordan 4 and the Adidas Futurecraft 4D have already taken over the battlefield. Now if you weren’t lucky with any of those, you might wanna try harder with the following ones. Dropping on the first of February, this release pays tribute to Adidas’ first experimentation with BOOST, the Energy BOOST. 5 years ago, Adidas stepped into the future and rose the bar so high for other sneaker brands in the competition. This renewed version features the same color combo as its 5-year-old precedent. 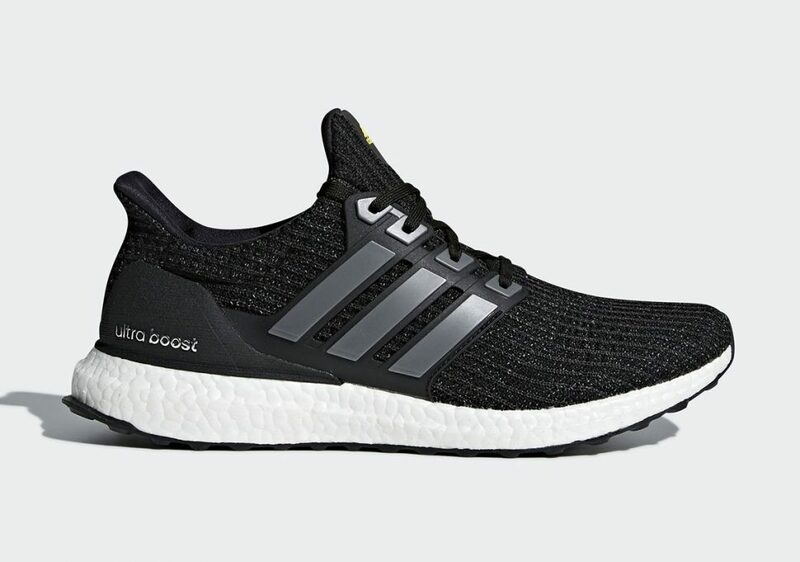 The Adidas Ultra BOOST 5th Anniversary is constructed of Black Primeknit, with grey shades for the side panel branding. Some popping yellow details appear on the tongue, laces, bottoms, and insoles. This is going to be one of 2018’s limited sneaker releases and will be available at a limited number of Adidas retailers, for the price of $180. One of the most anticipated new sneaker releases in 2018, is that of the Nike Air Max 270. This brand new silhouette draws inspiration from the past, specifically from the Air Max 93 and 180, while being Nike’s first ever 100% lifestyle shoe. 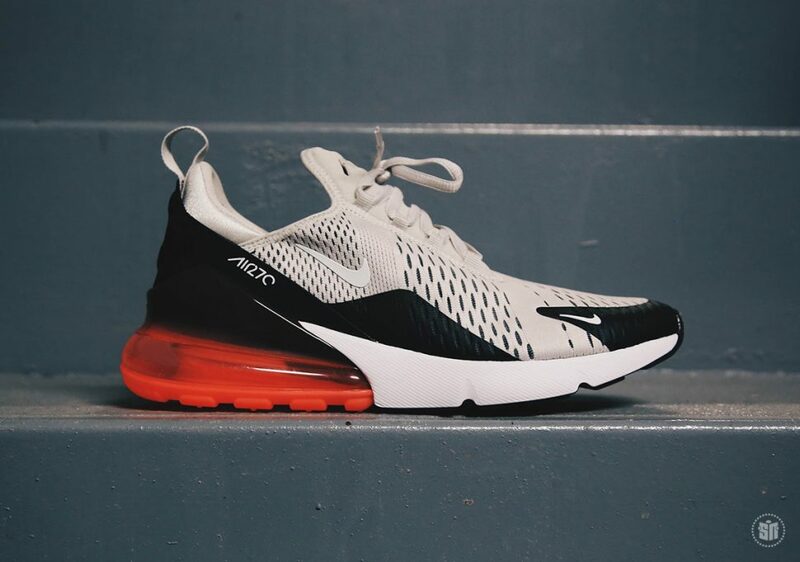 The Air Max 270 features the tallest Air Max heel ever, 32mm. So you can expect the highest level of comfort flexing this true masterpiece. The Air Max 270 will make its limited debut on February 1st, 2018. But expect more colorways to drop throughout 2018. 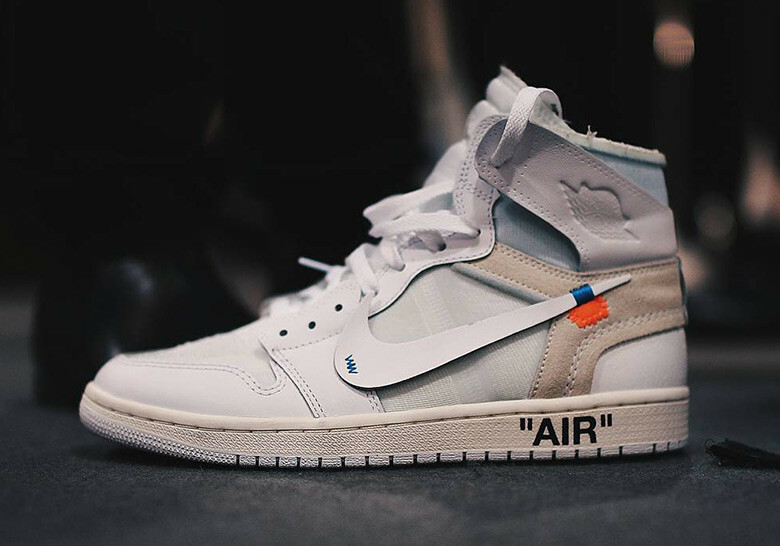 Rumors have been going on and off regarding Nike and Virgil Abloh’s Off-White collaboration. It seems that people need more of last year’s most hyped sneaker releases, and they just might get what they’re asking for. According to recent news and leaks, the sequel for the Nike X Off White collection is set to release in February 2018. What to expect from this collection? Well, You can expect two colorways of the Nike Vapormax, Nike Air Presto and Air Jordan 1. In addition to 1 color of the Nike Air Max. More rumors are circulating about the Nike Air Force 1s, and pictures have surfaced showing the sneaker in an all-black version in both high and low-top silhouettes. However, these are still plain rumors. Another sneaker that might release as part of this collection, is the Chuck Taylor X Off White that was supposed to release last year. But due to manufacturing issues, it didn’t. So Off White fans are waiting impatiently for these to release. Not all sneakers have official dates as yet, however, it looks like the Air Jordan 1, and the new Air Vapormax are dropping on February 27th, 2018. And if Nike and Off White are going to drop this collection the way they dropped the previous one, you will have 10 sneakers to fight for. So be Prepared! 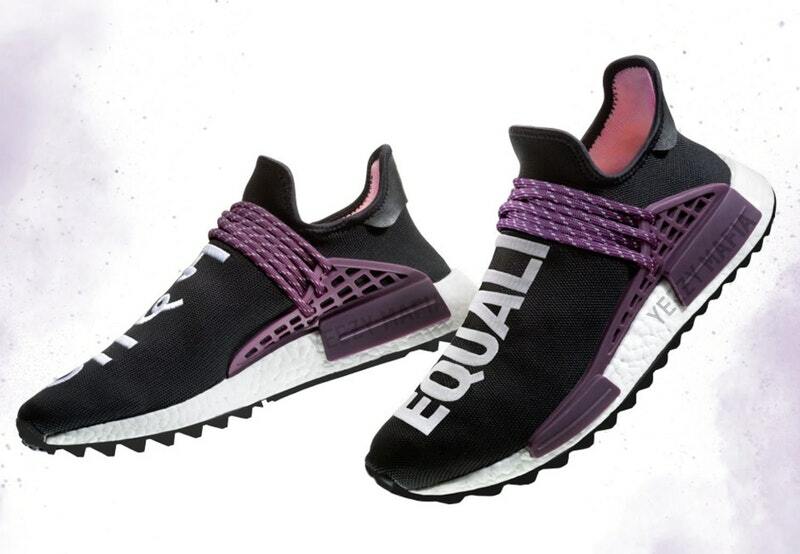 Near the end of February, Adidas will launch the new NMD Hu Trail collection. As you all know this pack of sneakers is usually the result of a collaboration with the singer/ songwriter Pharrell Williams. 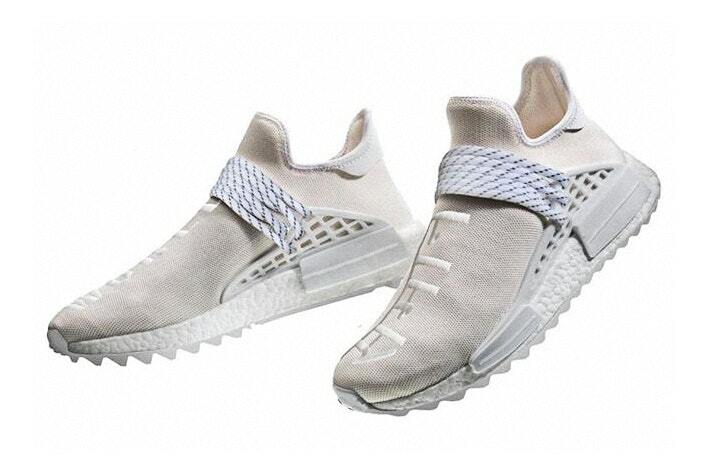 The new Pharrell X Adidas NMD Hu Trail will debut on February 23rd with the cream version ‘Blank Canvas’. This pack draws inspiration from the Holi Color Festival in India, which celebrates peace, love, and colors. Following on the release of the blank canvas, 3 more colorways will drop as part of this collection. Two of these colorways are quite cheerful and fun. The chalk coral and pink glow truly look like sneakers you had worn to the Holi festival. In Addition, the Black pair of this collection will release also on that same day. 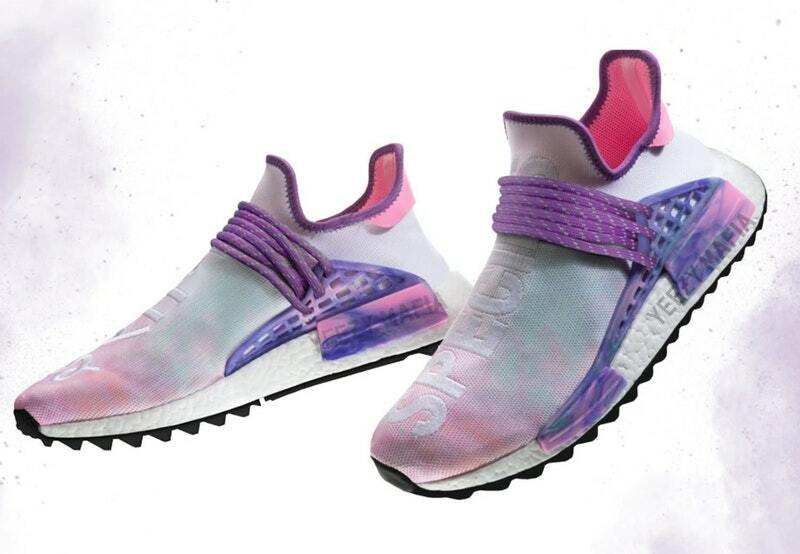 The 3 pairs of the NMD Hu Trail Holi will release on March 2nd, 2018. After releasing as part of a 3-piece bundle that retailed for $760, the Yeezy Desert Rat 500 is dropping again soon. Releasing the classic way this time, the Yeezy Desert Rat 500 Blush is going to be very limited and to retail at $200. What applies to any other Yeezy release applies in this case. Yeezy fans will fight, cry and take as many Ls as they possibly can handle to get their hands on a pair. And only a few of them will. 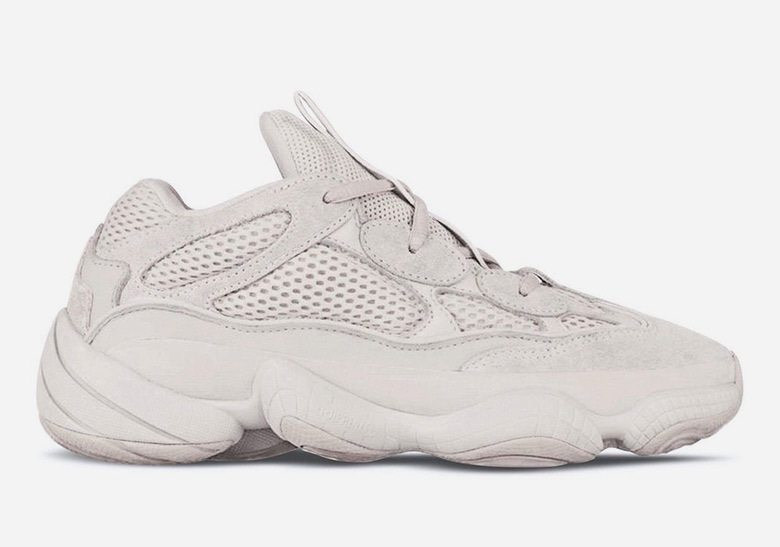 You can expect The Yeezy Desert Rat 500 Blush to drop sometime in February or March, at on Adidas, Yeezysupply and at select retailers. It seems like the first Yeezy Boost 350 v2 to release after the blue tints will be the ‘Peanut Butter’. Featuring all-earthy uppers, with boost material in the midsoles and gum outsoles. the Yeezy Boost 350 V2 Peanut Butter will be dropping in June 2018. It boasts a very simple and easy on the eyes uppers, without the zebra pattern or the bold red ‘SPLY-350’ branding. After calling the blue tints, the last v2s for a long time, rumors in the market started rising. Many leakers and fans were saying that this was the end of the V2 line. But here we go again, more V2s for the eager fans around the world. 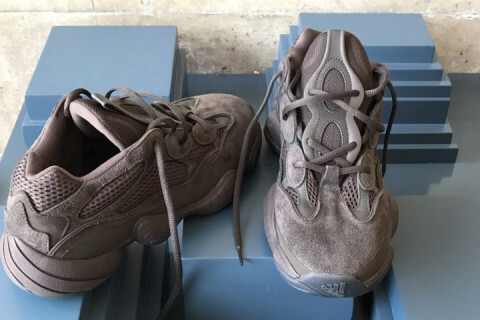 So far we’ve only seen the Yeezy Desert Rat 500 in 3 colorways. And since the Supermoon yellow released in December, and the Blush is releasing in February or March, we have only one option. On their Twitter account, the Yeezymafia announced that a new Desert Rat 500 is set to release in June 2018. And we have all the reasons to believe that the Pirate Black is the colorway releasing then. Constructed with a mixture of Cow leather, Suede, and mesh, the new Desert Rat boasts, tonal all grey uppers and adiPRENE outsoles. You can expect these sneakers to retail at $200 at Adidas, Yeezysupply and other select retailers in June 2018. Another V2 making its debut in 2018 is the Yeezy Boost 350 V2 Sesame. Dropping in August 2018, it seems to be the new “Oxford tan”. And we’re really hoping it makes the same amount of profit. This new tonal colorway of the V2 line, features clean sesame primeknit uppers, without any pattern or the “SPLY-350” Logo. 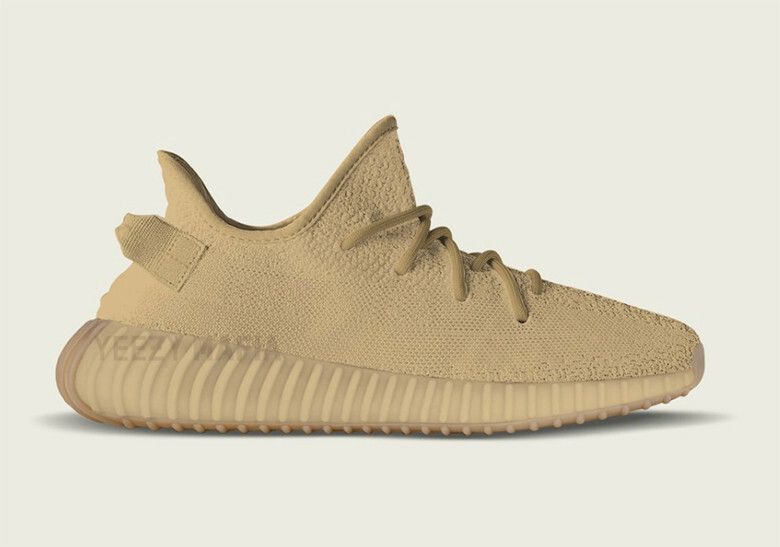 As with all 350 v2, the Sesame flaunts Boost material for the soles along with matching gum outsoles. The expected retail price of this new Yeezy Boost is $220, and you better believe that the hype over these, is REAL! Dragon Ball Z fan or not, you’ve probably heard of this collection, checked the images and maybe even added a sneaker or 2 to your shopping list. So, regardless of any other sneaker releases in 2018, we can say with a clear conscience that the Adidas X Dragon Ball Z will be the biggest drop this year. If not ever! The 8-sneakers collection will apparently drop in sets of 2 over the range of 4 months. The first set will include Goku’s Adidas ZX 500 Rm in Goku’s signature Orange and Blue. 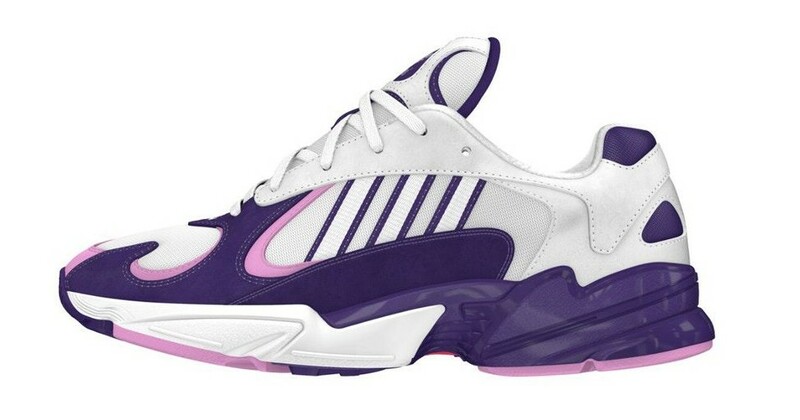 Alongside Frieza’s Brand New Adidas Yung-1 in white and purple. These 2 sneakers are set to release in August 2018. In September, the next 2 sneakers of the DBZ capsule will see the light of day. 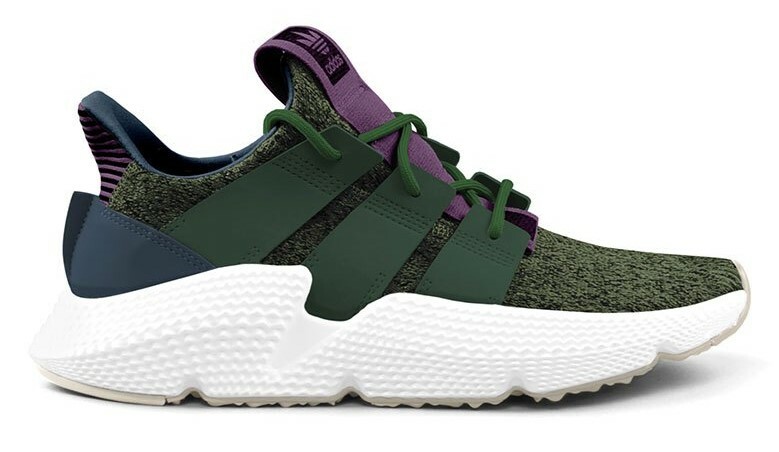 Adidas Prophere in Hues of Green and purple accents is going to be Cell’s sneaker. Coming head-to-head against Cell is Son Gohan, with his Adidas Deerupt sneakers. The Deerupt will feature an all purple upper, contrasting white soles which seem to have BOOST, and a net-like construction covering the whole shoe. We still don’t know why Adidas would skip October and set the next DBZ sneaker releases in November, but that’s just how it is. Vegeta and Majin Buu will have a face-off in November, they’ll be flexing the Adidas Ultra tech and the all-new Kamanda. Vegeta’s UltraTech will feature blue uppers with yellow accents and White Boost Soles, a color palette that really matches the character. Majin Buu’s sneaker, on the other hand, is quite interesting. Featuring skin pink uppers that match his skin color, blue laces, yellow heel notch and Kamanda logo on the sides. Add to all these elements, Adidas’ brand new outsole design in black. Last but definitely not least, the 2 super mega dragons Shenlong and Super Shenlong will come face to face in a final battle. For these mighty beasts, Adidas went for the EQT MID ADV. 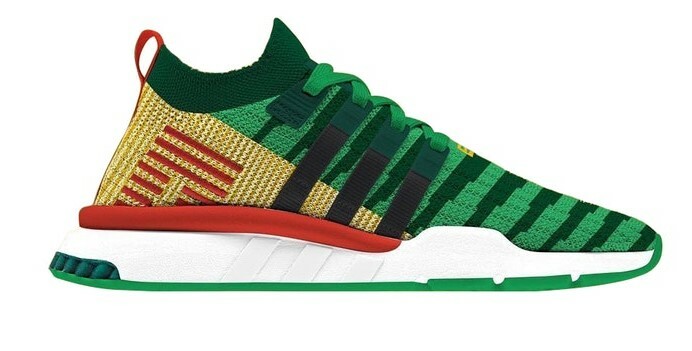 The EQT MID ADV will appear once in a bold Green/Orange/Yellow colorway with white outsoles for Shenlong. As for Super Shenlong, Adidas Dressed the EQT MIND ADV DTC in more subtle colors. It features Black and Gold Uppers with a reptile like a pattern along with core black outsoles. The 2 dragons are going to battle in December 2018. And whichever wins gets to have a very merry Christmas. So, as you can see, this year is full of crazy releases making all sneakerheads drool over them. And if you’re one of these people, you need to start saving up. A real sneaker collection doesn’t come cheap, or easy for that matter. Investing in sneakers can indeed cost a lot, but will bring in some unimaginable profit. Especially in the case of such hyped and sought-after sneakers. And if you think you can cop any of these on your own, Think Again! The sneaker reselling industry is growing bigger and crazier by the day. And trust us when we say, resellers will have no mercy over novice and inexperienced sneakerheads. Therefore, get yourself a powerful sneaker bot, rent a reliable server and buy a handful of sneaker proxies. And most of all be physically and psychologically ready because the competition over these is fierce.